but instead to write a modern work in the same tradition. This version of The Hobbit has been described as a Tolkien Handbook. It features a wealth of information about this marvelous story, and the man who wrote it; all painstakingly compiled by Douglas A. Anderson, an American academic whose specialty is Tolkien. There is an extensive introduction which includes biographical notes, photographs, literary influences, the writing and publishing history of the original text, and many reviews. This annotated version of the novel itself is also illustrated with watercolours and line drawings by Tolkien himself. Notes to the text appear in the margin of each page of the novel proper, and cover a vast field of background knowledge. 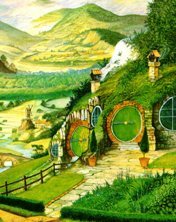 Included in the notes are excerpts from Tolkien's letters and interviews; definitions and derivations of uncommon words; alterations to the text, including the full text of the original Chapter 5, Riddles in the Dark; literary allusions and influences; foreign language translations; illustrations from foreign editions; critical commentary from Tolkien scholars such as Tom Shippey; biographical notes and much more. Additionally, in true Tolkien fashion, there are appendices! Appendix A is The Quest for Erebor, originally published in Unfinished Tales. In this tale Gandalf explains to the hobbits, after the War of the Ring, his part in Bilbo's adventures. Appendix B discusses Dwarf runes. The bibliography lists all of Tolkien's works, his revisional notes on The Hobbit, translations and illustrated editions of The Hobbit, selected criticism, and Tolkien societies. Finally and wonderfully, there is a small map of Wilderland. © 1957 by George Allen & Unwin Ltd., 2002 by Douglas A. Anderson. Images © Roger Garland.